The ExoMars Trace Gas Orbiter (TGO), Emirates Mars Mission (EMM), and possible future Mars stationary satellite(s) will provide innovative data products on the optical depth of dust and water ice clouds in the Martian atmosphere with a temporal resolution of hours. The science phase of TGO has begun in April 2018, and the EMM science operation is scheduled to start in 2021. In this work, the relationship between TGO, EMM, and precursor missions/instruments is analyzed based on the obtained data products. This is followed by discussing the foreseen innovation from the latter in the fields of Martian climatology and numerical weather forecasting. The optical depth is one of the basic characteristics of Martian aerosols, such as dust and water ice clouds. Primarily, it is an input parameter widely required for the modeling and satellite retrieval of Mars atmospheric data. Furthermore, the Mars optical depth is used for the specification of engineering parameters and planning of entry, descent, and landing operations of spacecraft. Montabone and Forget (2018a) and Montabone et al. (2015, 2006) illustrate the use of reconstructed climatological data on the dust optical depth for supporting future Mars landings. In addition, such data can potentially be used in the planning of aerocapture maneuvers in the future. Moreover, the dust optical depth has implications for the solar panel management of Mars rovers and landers, whose power generation may be compromised due to the down settling and obscuration caused by atmospheric dust (Mazumder et al. 2006). A most recent example is the loss of contact with the Mars Exploration Rover “Opportunity” during the global dust storm event that occurred in the middle of 2018. At the onset of the event, the rover entered a safe mode and did not recover later (at least, not until the time of writing this paper). Systematic mapping is required as the Martian atmosphere exhibits considerable temporal and spatial variability. Because of the Mars orbit eccentricity, a sharp contrast exists between the perihelion season (corresponding to solar longitudes LS from 180° to 360°) and the aphelion season (whose LS ranges from 0° to 180°). The perihelion season is relatively warm and dusty from the southern hemisphere (where is summer) to the northern midlatitudes. The temperatures in the northern polar night are as low as those in the southern polar night (although the southern winter lasts longer than the northern one). Dust is present in the Martian atmosphere even in the aphelion season (at a background level), and local dust storms can always occur. The presence of water ice clouds in the equatorial region is more characteristic of the aphelion season. Moreover, they are observed during both the aphelion and perihelion seasons in the respective winter hemispheres. The seasonal cycle of water ice clouds exhibits relatively low interannual variability. Dust has pronounced interannual variability because of the occurrence of dust storms. Although local and regional dust storms can be observed during any Martian year, global dust storm events are irregular in time. On average, they occur every few Martian years (Zurek and Martin 1993). The Martian dust and water cycles are described in detail by Smith (2008) and Haberle et al. (2017) among other publications. This article is a review written to prepare for the scientific exploitation of satellite data on the Mars aerosol optical depth with a temporal resolution of hours. These data will be provided by several upcoming satellite missions including the ExoMars Trace Gas Orbiter (TGO), which has been in the phase of science operation since April 2018. Another data source will be the Emirates Mars Mission (EMM, also known as the Hope Mars Mission), which is currently in the final stage of planning and will enter the science operation phase in 2021. Moreover, mission concepts for future Mars stationary satellite(s) monitoring dust and water ice clouds are being developed. The main goal of this article is to provide an overview explaining how the optical depth data obtained by these missions may complement each other. Also, it illustrates synergies with precursor missions such as the Thermal Emission Spectrometer (TES) onboard the Mars Global Surveyor (MGS) and Mars Color Imager (MARCI) onboard the Mars Reconnaissance Orbiter (MRO). Particular attention is paid to highlighting the scientific value of newly generated data with a temporal resolution of hours. The article is organized as follows. Section 2 focuses on satellite missions and their science instrumentation. A comprehensive description of the mission timelines and orbits is provided in Section 2.1. In Section 2.2, the relevant science instrumentation of TGO is described, and the relationship between the TGO instrument of the Atmospheric Chemistry Suite/Thermal InfraRed spectrometer (ACS/TIRVIM) and EMM instrument of the Emirates Mars Infrared Spectrometer (EMIRS) is outlined. In Section 2.3, characteristics of the EMM instruments of EMIRS and Emirates Exploration Imager (EXI) are provided, and similarities and modifications with respect to the precursor satellite instruments TES onboard MGS and MARCI onboard MRO are highlighted. In Section 3, possible scientific innovations based on the obtained dust and water ice cloud optical depths with a temporal resolution of hours are suggested. In particular, the significance of these data for Martian climatology and numerical weather forecasting is discussed in Subsections 3.1 and 3.2, respectively. Section 4 provides an outlook on the mutual benefit of using data from TGO, EMM, and precursor missions/instruments. Finally, scientific innovations based on the aerosol optical depth data with a temporal resolution of hours are summarized. 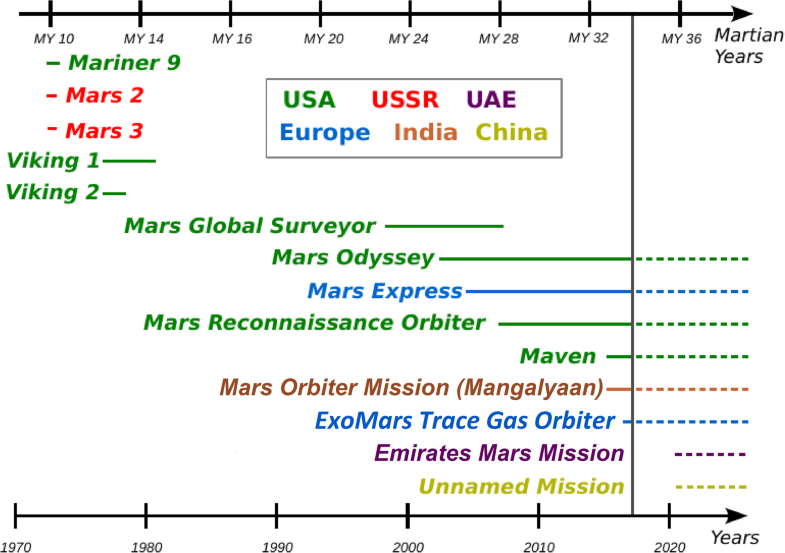 A comprehensive plot containing the timelines of the past, current, and upcoming satellite Mars missions including MGS, MRO, TGO, and EMM is provided in Fig. 1. The science operation of MGS ended in 2006. The routine science operation of MRO began in 2006, and that of TGO has started in April 2018. The science operation phase of EMM is scheduled to begin in 2021. 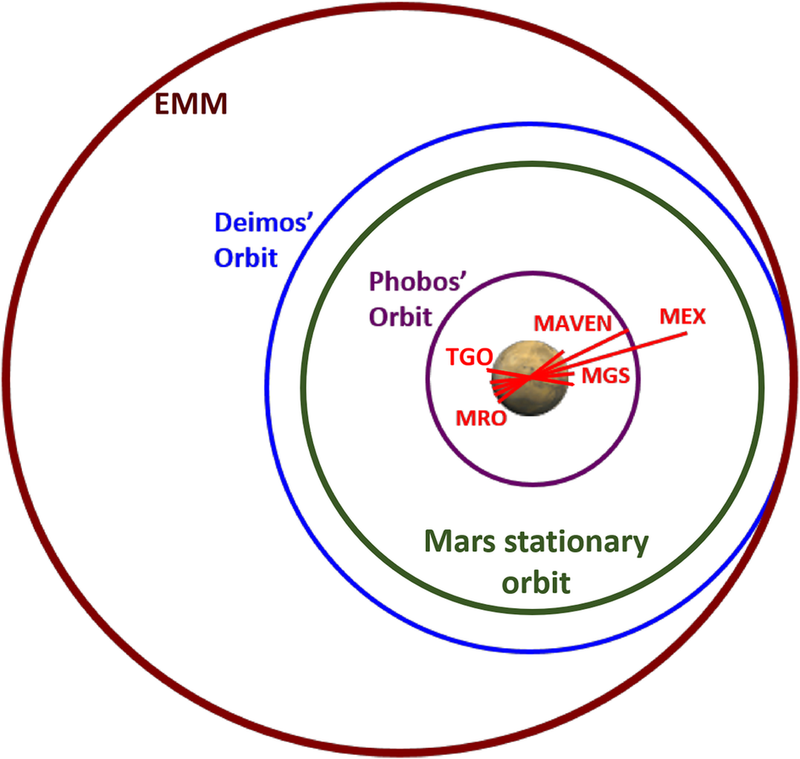 Thus, temporal overlaps are expected to occur between TGO, EMM, and several other missions (including MRO). The illustration of the mission orbits is provided in Fig. 2. The science orbit of MGS was sun-synchronous at an average altitude of less than 400 km. The ascending node of MGS was at 2 pm local solar time (Albee et al. 2001). Note that MGS followed a different orbit during its aerobraking phase as described in Section 2.3.1. MRO has a near circular science orbit at altitudes of around 300 km, which is sun-synchronous with an ascending node at 3 pm local solar time (Zurek and Smrekar 2007). The science orbit of TGO is circular at an altitude of 400 km (Vago et al. 2015). The orbit periods of MGS, MRO, and TGO are close to 2 h. On the contrary, the EMM science orbit is considerably higher with an altitude varying between approximately 20,000 and 44,000 km (corresponding to the periapsis and apoapsis, respectively). The orbital period will be about 55 h (Sharaf et al. 2017). Note that the timeline of possible future Mars stationary satellite(s) is still unspecified. Montabone et al. (2018) proposed a baseline mission scenario that involved ridesharing with an unidentified future primary orbiter mission, which explicitly focused on dust and water ice clouds. The Mars stationary orbit altitude is around 17,000 km above the equator (see also Fig. 2). The main goal of TGO is to inventory trace gases (such as methane and others) in the Martian atmosphere and their spatial and temporal variations (Zurek et al. 2011). As already mentioned in Section 2.1, the science mapping phase of TGO began in April 2018, and the nominal end of the mission is scheduled to occur in 2022. The final science orbit of TGO is circular at an altitude of 400 km with an inclination of 74°. This configuration will allow performing solar occultation measurements during each orbit. The thermal infrared component of ACS (Korablev et al. 2018) of TGO named TIRVIM covers the wavelength range from 1.7 to 17 μm. The primary goal of TIRVIM is the temperature profiling and aerosol monitoring in the lower/middle atmosphere by nadir observations. Following the orbit of TGO, nadir measurements are confined to latitudes of ± 74° (in contrast, TGO solar occultation measurements will extend well over polar regions). Complete spatial coverage in the monitored latitude range will be achieved by TIRVIM nadir observations in 7 sols. In addition, full daily coverage including the characterization of the atmospheric state for any hour of the day will be achieved every 2 months. The wavelength range of TIRVIM overlaps with that of the EMM instrument of EMIRS (~6–40 μm; see also Section 2.3.1). Since both instruments are thermal infrared spectrometers, their measurement operation principles have a certain degree of similarity. Because of the higher spectral resolution of TIRVIM, a finer vertical temperature resolution of a few kilometers and higher altitude coverage (from the surface up to 55–60 km) will be achieved. For comparison, a resolution of 10 km and altitude coverage of 0–50 km are expected for EMIRS. Practically, full global and diurnal coverage will be provided by EMIRS in ~ 10 sols (see also Section 2.3.1), and polar latitudes will be covered by EMIRS. TGO also hosts the CASSIS imager, which, however, does not operate in the ultraviolet (UV) range (Thomas et al. 2017). Hence, it is not compared with the EMM instrument of EXI described in Section 2.3.2. The primary science phase of EMM is scheduled to begin in 2021 and continue for two Earth years (which are equivalent to approximately one Martian year). In addition, EMM is designed for an extended science phase that will last two more Earth years. Two instruments of the EMM scientific payload will characterize the optical depth of dust and water ice clouds. This will be based on measurements conducted in the thermal infrared spectral range by EMIRS and in the UV and visible range by EXI. EMIRS is an interferometric spectrometer operating in the thermal infrared range (Altunaiji et al. 2017). The instrument has been jointly developed by the Mohammed Bin Rashid Space Centre (MBRSC), Dubai, UAE and the Arizona State University (ASU), AZ, USA. It represents an upgraded version of the thermal infrared spectrometers from the Mars Space Flight Facility, ASU, which include TES onboard MGS (Smith et al. 2001; Christensen et al. 2001). The latter achieved unprecedented global mapping of the seasonal variations of the Martian atmosphere and surface and provided crucial insight into the interannual variability primarily driven by dust storms. Overall, TES defined the present standard of global Martian climatology (see the review written by Smith (2008)). The main specifications of EMIRS are listed in Table 1. It covers a spectral range of ~6–40 μm, which is equivalent to around 200–1600 cm−1 (in the units of the inverse wavelength). The default spectral resolution of EMIRS is close to 5 cm−1. The instrument has an instantaneous field of view (IFOV) with a width of 6 mrad. These values are slightly smaller than the corresponding TES parameters (6–50 μm, 5 or 10 cm−1, 8.3 mrad; see Smith et al. (2001)). 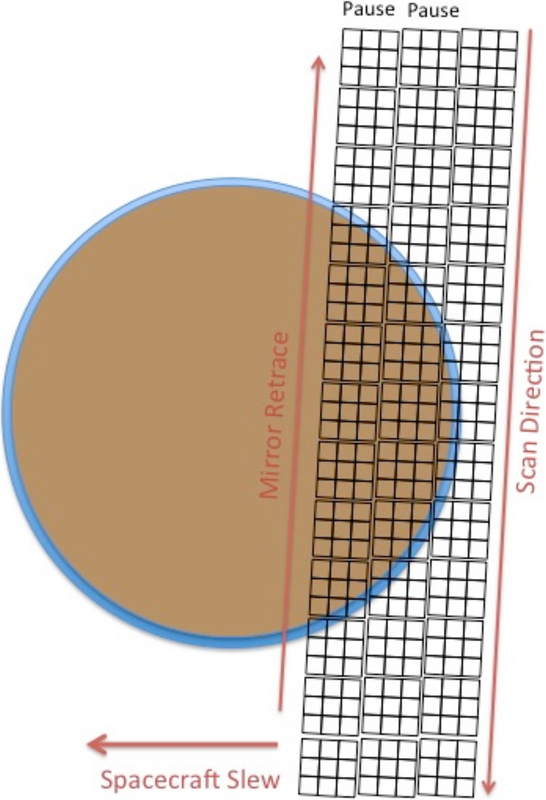 Further, EMIRS utilizes a 3 × 3 array detector, which corresponds to a 3 × 3 element instrumental footprint (illustrated in Fig. 3). The ground pixel size of EMIRS varies between ca. 100 and 300 km, which are consistent with the IFOV width of several mrad and orbital altitudes between 20,000 and 44,000 km. Similar to the TES data products, the parameters that will be retrieved from EMIRS include those of dust, water ice clouds, water vapor, three-dimensional temperature distribution in the lower and middle atmosphere, and surface temperature. The retrieval of the lower atmospheric temperature from the EMIRS instrument will be based on CO2 absorption features. Its vertical resolution will be close to 10 km for altitudes ranging from 0 to 50 km (Altunaiji et al. 2017). EMIRS will achieve nearly complete global and diurnal coverage of all retrieved variables in about 10 days. EMIRS has a measurement strategy based on one observation cycle scanning over the full Martian disk with minimal gaps. Its line of sight is controlled by both spacecraft attitude maneuvering and rotating the instrument’s scan mirror as shown in Fig. 3. During any observation cycle, the spacecraft attitude moves at a constant slew rate, whose value depends on the orbital altitude. The EMIRS mirror performs scanning sequences in the direction crosswise to the spacecraft slewing that is accompanied by retracing and, if necessary, pausing. A complete observation cycle will take about 32 min at the periapsis and around 15 min at the apoapsis. In total, about 20 global-hemispheric observations per orbit (or around 60 global-hemispheric observations per week) will be conducted. With the high-altitude EMM spacecraft orbit (from approximately 20,000 to 44,000 km; see the details in Section 2.1), the planned operation of EMIRS is reminiscent of the apoapsis portion of the aerobraking orbit of TES onboard MGS. The latter was highly elliptical with an initial apoapsis altitude of 58,000 km. In the apoapsis part of its orbit, the spacecraft executed a roll motion. Combined with the motion of the TES pointing mirror, the near-full Martian disk could be imaged in around 100 min. The algorithms employed for retrieving the dust and water ice cloud optical depths are described by Smith et al. (2000) and Pearl et al. (2001), respectively. First, the composite column integrated optical depth of dust and water ice clouds is determined by numerically solving the radiative transfer equation (the atmospheric and surface temperature are necessary parameters). Vertically resolved atmospheric temperatures are retrieved in advance from the 15-μm CO2 band. Subsequently, the optical depths of dust and water ice clouds are disentangled by fitting predefined spectral shapes. A data-filtering criterion is given by the surface temperature being above 220 K to ensure sufficient thermal contrast between the surface and the atmosphere. Smith (2004) described an enhanced retrieval algorithm version, which included the simultaneous retrieval of the surface temperature, improved spectral shape fitting for dust and water ice clouds, the use of a map of surface emissivity parameters, and more realistic assumptions regarding the vertical distribution of water ice clouds. The uncertainty of the dust and water ice cloud optical depth is specified to be 0.05 or 10%, whichever is larger. As part of EMM, the multi-band imager instrument EXI (AlShamsi et al. 2017) will be sensitive to UV and visible wavelengths. In total, it comprises six different spectral bands: three in the UV range and three in the visible range. The UV and visible optical paths are separated by a dual lens system. The subdivision into six spectral bands is accomplished by bandpass filters centered around the UV wavelengths of 220, 260, and 320 nm and visible wavelengths of 437 (blue), 546 (green), and 635 nm (red). All bands share a single focal plane. The detector consists of a radiation-tolerant CMOS sensor with a resolution of 12 megapixels and ensuring high radiometric quality. Both the visible and UV channels are capable of capturing the full Martian disk from the apoapsis to the periapsis. A single pixel of the UV (visible) channel has an angular dimension of 23″ (22″). The ground resolution is a few kilometers per pixel and varies by a factor of about 2 between the apoapsis and the periapsis. 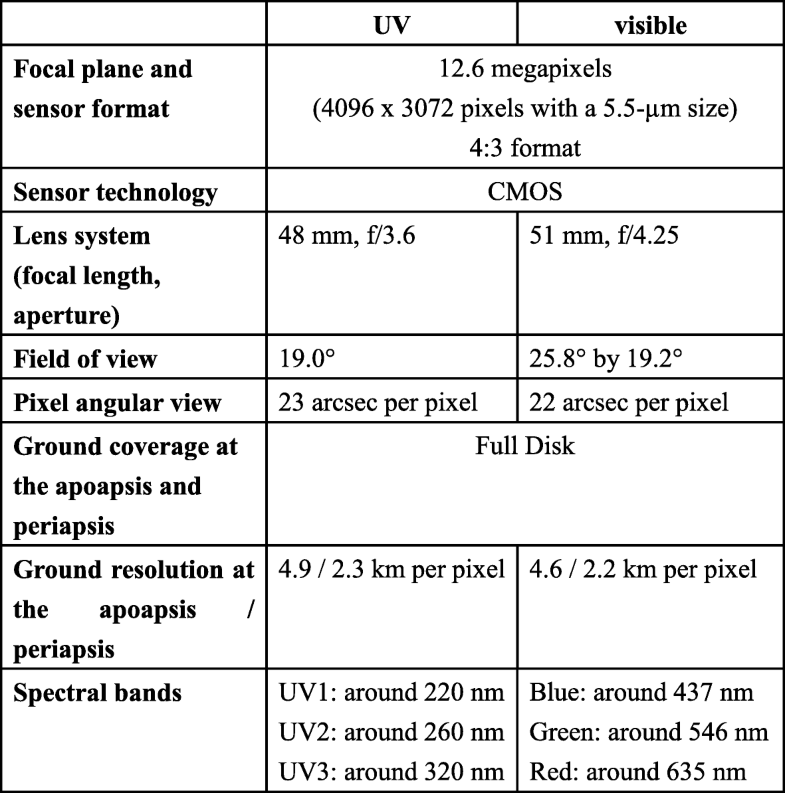 The specifications of the EXI instrument are listed in Table 2. It has been jointly developed by MBRSC and the Laboratory for Atmospheric and Space Physics (LASP), University of Colorado Boulder, CO, USA. The retrieval of the water ice cloud optical depth from EXI will be similar to that from MARCI (Bell III et al. 2009; Malin et al. 2008). The retrieval methodology for MARCI is based on multiple-scattering radiative transfer modeling and relationships between aerosol properties derived by Wolff et al. (2010). The algorithm was reported in detail by Wolff et al. (2011). The estimated uncertainty of the resulting water ice cloud optical depths was in the range of 0.02–0.03 with a detection limit close to 0.05. An algorithm version with enhanced retrieval sensitivity particularly under low water ice cloud conditions was described by Wolff et al. (2014). The input parameters for the retrieval include dust optical depth from the CRISM1 climatology and a surface reflectance database (also generated by MARCI). Note that the algorithm cannot separate between water ice clouds and surface ice. Thus, the resultant data must be quality-flagged using auxiliary information on the Mars polar caps. Note that CO2 ice clouds will be also detectable by EXI, but it is not possible to unambiguously discriminate between water and CO2 ice clouds with EXI. However, because of their high altitude and local isolation, mesospheric CO2 clouds are generally optically thin when viewed at the EXI resolution. Thus, they represent a minor error source in the planned retrieval of the optical depth of water ice clouds from the EXI instrument. EXI will also have an option to use simultaneously retrieved data on the dust optical depth as an input parameter for the water ice cloud optical depth and other retrievals. The dust optical depth at 220 nm will be retrieved by combining measurement information from the EXI bands centered around 220 and 635 nm (AlShamsi et al. 2017). Overall, the scientific operation concept of the EXI instrument is based on contemporaneous images from the bands centered around 220, 260, 320, and 635 nm and will allow the retrieval of dust, water ice clouds, and ozone (AlShamsi et al. (2017)). A detailed formulation of the spatiotemporal mission requirements for EXI is provided in Table 3. The diurnal and geographic requirements are fulfilled within 10 days and less than 72 h, respectively. ≥ 2 local time intervals for all latitudes equatorward of ± 50°. In any given span of 10 days, at least one of the four 3-h intervals spanning from 6 am to 6 pm local time is sampled with at least 50% longitude coverage for all latitudes equatorward of ± 80°. ≥ 80% of the Mars geographic area is sampled more frequently than every 72 h.
Latitudes ≤ 80° are sampled more frequently than every 72 h.
Observations over one full Martian year (goal: 20 out of the 24 LS intervals of 15° are included). A review on TES as well as foregoing and ongoing instruments was published by Smith (2008), with their individual data records on the dust and water ice cloud optical depth being an integral part. In addition, an overview of the dust climatology from TES/THEMIS2 and recent single-instrument records of dust and water ice cloud characteristics is provided by Haberle et al. (2017). Various Mars atmospheric and surface parameters are publicly available on the website of the Mars Climate Database (MCD; http://www-mars.lmd.jussieu.fr/). As part of its version 5.3, MCD provides a multi-instrument climatology of the column dust optical depth described by Montabone et al. (2015). These data are based on the optical depth from TES and THEMIS nadir measurements at ~ 9 μm and Mars Climate Sounder (MCS)3 limb measurements at ~ 22 μm. Vertical integration and extrapolation as well as wavelength conversion are performed on the limb-measured data from MCS. To account for topography-related variations, all optical depth values are normalized to a reference pressure of 610 Pa. Two different products of daily maps exist. The first product includes regularly distributed grids with missing data at some grid points and the latitude/longitude resolution being different between the Martian years 24–26 and afterwards, generated by iterative weighted binning. The second product is given by uniformly gridded maps constructed through spatial interpolation by the kriging method. A climate database on the water ice cloud optical depth is publicly available from https://gemelli.spacescience.org/twiki/bin/view/MarsObservations/MarciObservations/. Progress reports on the construction of this database were provided by Wolff et al. (2011, 2014). As explicitly noted by Montabone et al. (2015), upcoming dust climatological data may account for diurnal variations by combining data resulting from day and night side observations. Taken in the most general sense, we note that any time-resolved data record can potentially improve the existing dust climatology. This, in turn, implies that dust optical depths obtained at different times of the day (e.g., in the morning, noon, and evening) will be suitable for the refinement of existing dust climatologies. In principle, this approach is also applicable to new data products on the water ice cloud optical depth and existing water ice cloud climatology. In this work, it is assumed that the majority of new data products will be based on daytime measurements. Nighttime data on dust and water ice clouds may not be available for different reasons such as the necessity of sufficient thermal contrast between the surface and the atmosphere for successful data retrieval or the presence of solar light. A surface temperature higher than 220 K is required for the data retrieval from TES onboard MGS as described in Section 2.3.1. Therefore, the same will likely be true for the EMM instrument of EMIRS. Data assimilation is the combination of all available data on the state of a system obtained by a numerical model and measurement-based observations. To this end, data from both are interpolated/extrapolated in space and time by mathematical methods. As a result, the system is characterized by data that are optimal in terms of modeling and observations. Data assimilation mainly evolved from the need of numerical weather forecasting on Earth to be based on the best possible representation of the initial state. A basic description of the use of data assimilation in different areas of Earth System Science is provided in the book of Lahoz et al. (2010). In the 1990s, it has been proposed to use data assimilation for the reanalysis of spacecraft data obtained from Mars. The latter accounts for sparse data coverage and the unfeasibility to directly observe certain parameters by satellite remote sensing. Different types of data assimilation schemes have been developed including the Analysis Correction scheme (Montabone et al. 2014) and ensemble Kalman filtering ones (Greybush et al. 2012; Navarro et al. 2017a, 2017b). The remaining part of this section focuses on the future possibility of data assimilation preparing the initial state for the numerical forecast of Mars dust storms. In Montabone and Forget (2018a, 2018b), forecasting dust storms is considered one of the biggest challenges of numerical weather forecasting on Mars. Note that it is not possible yet mainly because of the shortcomings of the model representation of the dust storm initiation via surface and boundary layer processes and transition of dust storms to the regional and global scale. From the observational side, Mars stationary satellites are a promising source of data for improving the dust storm forecast in the future. By the assimilation of near-hemispheric satellite observations of aerosol and temperature into numerical forecast models, dust storms may be predicted days in advance. While presenting a concept for a future Mars stationary mission, Montabone et al. (2018) noted that EMM was the only other mission that had an orbit with similar altitude and near-hemispheric geographical coverage. Hence, it can be concluded that EMM is another valuable resource for achieving a better understanding of the Mars dust processes (especially dust storms) and advancing their numerical modeling. It should be noted that, in the case of their concurrent operation, EMM and Mars stationary satellite(s) will be highly complementary to each other (for example, the polar coverage by EMM may complement the orbiting of Mars stationary satellite(s) above the equator). Note that for TGO, it is rather its ability to provide vertically resolved dust aerosol data which is currently foreseen to improve models. The assimilation of MCS dust vertical profiles into Mars general circulation models (MGCMs) was shown to replicate features known from observations such as detached dust layers (Ruan et al. 2017; Streeter et al. 2017). The comparison of aerosol optical depth data from modeling and satellite is an important contribution to numerical weather forecasting. This is particularly the case for data on the optical depth of water ice clouds. Insight into the feasibility of the assimilation of water ice cloud optical depth data into MGCMs was provided by Navarro et al. (2017a, 2017b) and Steele et al. (2014). Such assimilation is currently not performed on a regular basis. The most critical aspect of this approach is its relationship with the temperature accuracy of the utilized models. As alternative procedure, cloud microphysical schemes of MGCMs are improved by comparisons against independent satellite datasets on water ice clouds and water vapor. These comparisons typically cover a time span of one selected Martian year without global dust storm events. The agreement with the satellite data serves as an indicator of the model performance (Pottier et al. 2017; Navarro et al. 2014; Madeleine et al. 2012). Using the above-mentioned principle, the quality of Martian numerical weather forecast models may be evaluated by comparing diurnal variations of the aerosol optical depth against satellite data (pronounced diurnal variations of the Mars optical depth are known from satellite observations (Kleinboehl et al. 2018), lander instruments (Colburn et al. 1989), and Earth-based telescopes (Akabane et al. 2002)). It should be noted that, in the case of a systematic error, it might not be possible to determine whether the observed data differences result from the model or the satellite. This follows from basic differences in the numerical weather forecasting on Mars and Earth outlined by Montabone and Forget (2018b). Nonetheless, diagnostic studies may also be based on the qualitative agreement between the diurnal variations obtained from model and satellite, i.e., analyzing whether diurnal cycles have the same phase and amplitude. Satellite data with a temporal resolution of hours providing a highly detailed evidence on diurnal variations will be invaluable for that purpose. Finally, it is worthwhile noting that comparisons of diurnal variations of data from local mesoscale numerical models and the Rover Environmental Monitoring Station were performed by a number of recent studies (Fonseca et al. 2018; Richardson and Newman 2018; Newman et al. 2017). That is because such comparisons are a good basis for investigating local meteorological phenomena at the Gale Crater. TGO, EMM, and future Mars stationary satellite(s) have a significant potential to provide highly innovative data products on Mars atmospheric properties with a temporal resolution of hours. In particular, diurnal variations in the Martian atmosphere will be characterized. One of these data products will be the optical depths of dust and water ice clouds from various satellite instruments operating in different spectral ranges. The relationship between recent, ongoing, and upcoming satellite missions/instruments was analyzed based on their dust and water ice cloud data. The science phase of TGO began in April 2018. Before the nominal end of the TGO mission in 2022, EMM will start its routine science phase. Complementary to TGO, EMM will provide high spatial and temporal data coverage from a high altitude orbit, which may be a basis for data consolidation through inter-instrumental comparisons of optical depth and other data. Moreover, the EMM instrument of EMIRS will allow revisiting the data record from its precursor TES (the same is true for the EMM instrument of EXI and MARCI). Note that TES and MARCI are parts of the payloads of the MGS and MRO missions, respectively. Thus, both instruments are tied to sun-synchronous orbits with a fixed local solar time. For different scientific applications, the innovations based on the data products on the dust and water ice cloud optical depth with a temporal resolution of hours have been identified and discussed. They include the refinement of dust and water ice cloud climatologies by the integration of time-resolved data. Another field of innovations is the improvement of the ability to predict dust storm events based on the assimilation of the data obtained from near-hemispheric observations of EMM and possible future Mars stationary satellite(s) into numerical forecast models. Moreover, an indicator for the quality of Martian numerical weather forecast models is given by comparing diurnal variations against the observational evidence provided by the satellites. We would like to thank the Manuscript Editing Services, UAEU Libraries, United Arab Emirates University for their professional help with final text editing prior to article publication. In particular, we are grateful to Mr. Shehab Majud, Coordinater, and any other person involved. This work was supported by the National Space Science and Technology Center at the United Arab Emirates University through the project Earth and Mars Atmosphere (grant no. 21R033-NSS Center 7-2017). AA proposed the topic, initiated the study, and collaborated with the corresponding author in the preparation of the manuscript. CG performed the literature search and case study using the Mars Climate Database v5.3 (web interface: www-mars.lmd.jussieu.fr/mcd_python/). Based on the obtained results, he prepared the manuscript. Both authors have read and approved the final manuscript version. CG received his Ph.D in Atmospheric Physics from the University of Bremen, Germany, in 2014. The focus of his Ph.D work was the scientific exploration of Earth atmospheric data from the satellite mission ENVISAT/SCIAMACHY (2002–2012). In 2014–2017, he held a postdoc-equivalent position at the German Aerospace Center (DLR). His task was extracting geophysical and meteorological parameters from Earth observation satellite images. He conducted several peer-reviewed research studies on the planetary atmospheric boundary layer. Currently, he is working on the research project Earth and Mars Atmosphere at the United Arab Emirates University, Al Ain, UAE. Note that CG has discovered his interest in Astro and Planetary Physics long before this work. During his graduation from the university, he wrote a diploma thesis in the field of gravity theory at the Bremen Drop Tower (ZARM) in 2010. In addition, he is an active member of an amateur astronomy club in the greater Bremen area (AVL Lilienthal). AA is Principal Investigator of the project Earth and Mars Atmosphere. The authors declare that they have no competing interests. They note further that they are not part of the EMM Science Team.